Family Discount: Include your second child to get 5% discount for each lessons. Second Program Discount: Get 5% discount from any second program. Full Semester discount: Get 5% discount from your Full Semester payments. *Please note that family, second program and/or full semester discounts cannot be combined. 30 min lesson - $19 for each student. No HST. 30 min private lesson -$32. No HST. 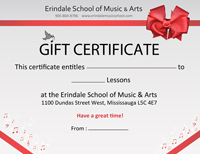 Surprise your friends and family with our Gift Certificate for music or art lessons!